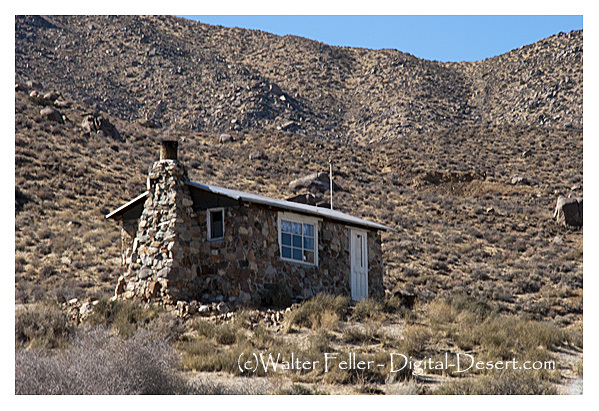 Russell himself has somewhat clouded the early history of this cabin by stating in his article on his prospecting activities in Butte Valley in 1925 that "at Anvil Springs there was a stone house and plenty of water." He further remarks that Carl Mengel, an early German prospector in the vicinity, had also stayed in the cabin at one time. Later he states: "We located the spring and the stone house and set up camp. We were never able to find out who built the house, but it was built to last. It dated back to the early 1880s and was as good as ever." 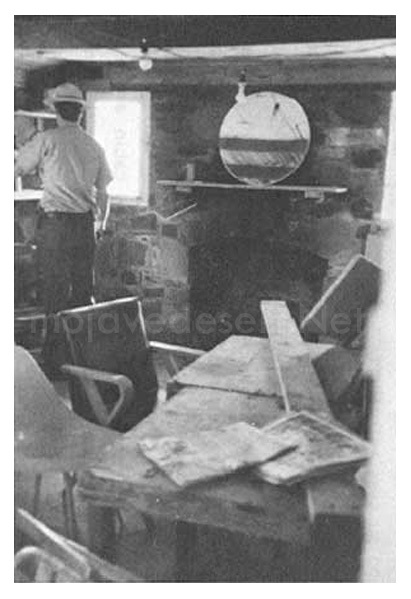 Because of Russell's later statement that he built the cabin at Anvil Spring in 1930, and because, in a 1929 photo of Anvil Spring by Margaret Long, the "Geologist's Cabin" does not appear, the obvious conclusion is that Russell was simply confusing Anvil Spring with Greater View Spring one-half mile further south, where indeed there is a spring and also an old stone structure possibly built as early as the 1860s or 1870s. This would seem to be proved by the picture of the cabin in which Russell and Huhn camped, which accompanies the article, which definitely is the Mengel cabin at Greater View Spring. Further confusion is provided by the map in the article, which shows Huhn and Russell's location at what is today known as "Russell Camp," another one-quarter mile or so south of Greater View Spring. 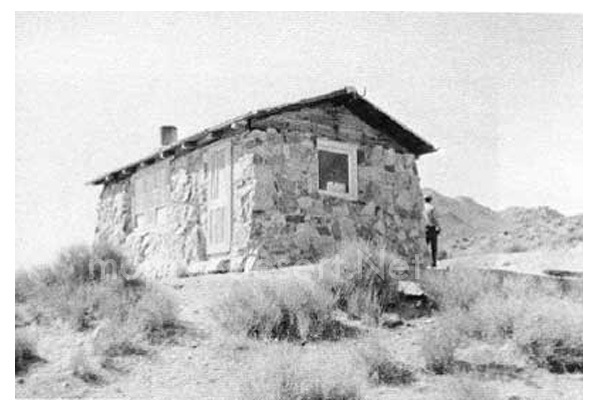 This particular complex, however, was also built by Russell when he returned to mine in Butte Valley in the 1930s. 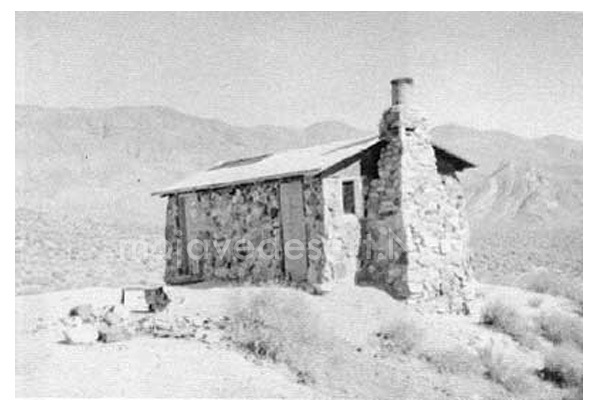 North and east elevations of "Geologist's Cabin" at Anvil Spring in Butte Valley. West and south elevations of "Geologist's Cabin." Note remains of small stone oven on terraced area. Interior along north wall of "Geologist's Cabin" in Butte Valley. Interior view toward south wall of "Geologist's Cabin." The stone cabin has most recently been lived in by a group of six retirees working the Anvil Spring claims. The one-room stone and masonry structure is solidly built with a green composition-paper roof that has been partially ripped off by vandals within the past year. The floor is cement and the wooden roof framing allows for storage space underneath the roof on the interior. 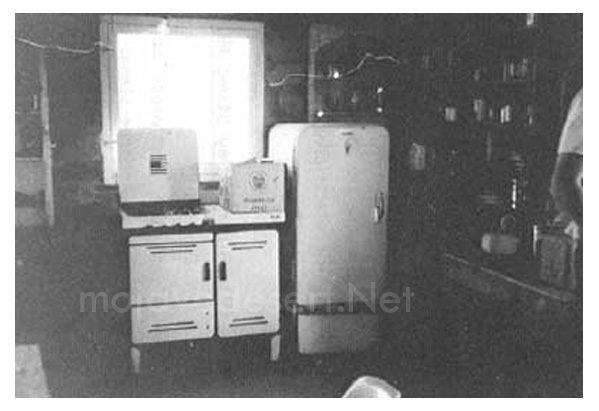 Inside the cabin are a gas stove, an empty refrigerator, and shelves stocked with canned goods, some appearing to have been recently added. Two tables (one for eating and one for working) and some chairs are found inside. On the south wall is a built-in fireplace with a round mirror positioned on the mantel. A wooden door (covered by kitchen shelves on the interior) is situated at the north end of the east elevation, and a large window has been placed on the south end. There are also a window on the north elevation, two windows (one on either side of the fireplace) on the south elevation, and two doors (the southernmost one boarded up) on the west elevation. A small stone oven on the outside terraced area west of the cabin has been vandalized and broken up. This may or may not have been part of the original complex. An outhouse and trash dump lie several yards north of the cabin. The house is wired for electricity, but no signs of a generator were found.